Attention Cat Lovers! This Is Weekend Cat Blogging #80! My bread baking pal KitchenMage is harboring all the links to this week's kitties. And if you need a good eyeball washing (or your faith in humanity restored), do stop over at Bernie Berlin's blog, A Place To Bark. . . And Meow. Her selfless, loving efforts are simply beyond extraordinary. You can also click here to see some of the fabulous donated artwork that will be going up for auction on ebay in January. The first phase of Bernie's art auction raised nearly $1,200 desperately needed dollars. All proceeds go directly to Bernie's non-profit dog and cat rescue, A Place To Bark, in Tennessee. And if you are looking for a special furry friend to share your life with, A Place To Bark always has lots of adorable animals hoping for new homes. Delivery to other states is even often possible. Hey, I made your oatmeal toasting bread today, and it is SCRUMPTIOUS! You can look on my blog for the details. Thank you so much for sharing! Oh, I love this picture. 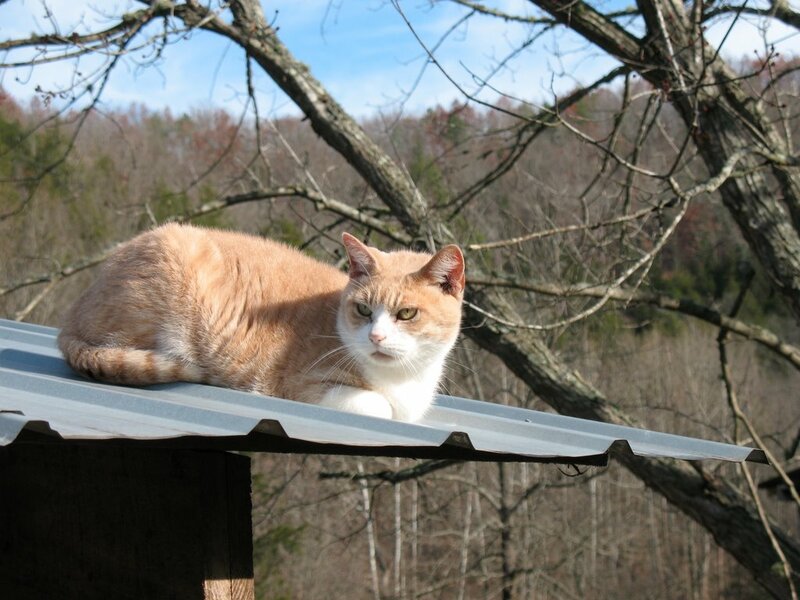 I am very partial to orange and white kitties though, having rescued one that stole my heart 2 1/2 years ago. Hi, I love your blog. Am also a MO shepherd! Since I am new to your writings I always check the Year Ago section - there is a small error in this URL, but it is easy to find the right page.